Why Use Goats for Land Management? When it comes to controlling weeds, most of us think of hand pulling, herbicides, mowing, etc. But if you’re looking for natural, non-toxic ways to control weeds you may be surprised to find out that goats can be a useful part of your weed management strategy. Used alone, goats and will not prove to be the silver bullet for weeds, but they can be a great addition to your weed control toolbox. 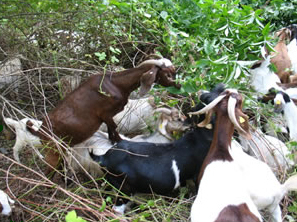 Goats will open up blackberry thickets, knock back Scotch Broom and eat a variety of other weeds. When the goats are done the area will not look mowed but they will have a significant impact. See photos for examples. We feel that the best approach to controlling weeds is an integrated approach, one that uses all of the tools in the toolbox that are applicable to your situation. One such approach is to use goats to open up a thick stand of blackberries followed by a hand crew to dig out the roots. All vegetation management projects require a long-term approach (5-10 years).